Byton’s electric concept car wowed at CES, and for good reason. The SUV has a lot of strong features, including a max range of 323 miles for the upgraded version, and a starting price of just $45,000. But the real jaw-dropping feature is a 49-inch display that covers the entire dash, providing a multifunctional information and entertainment interface in a way quite unlike anything else out there in the automotive world. It’s not the only display in the vehicle, either — there’s a tablet set in the steering wheel itself, which remains in a fixed orientation even as the wheel turns around it. There are two displays in the front-seat headrests, too, giving passengers access to a range of entertainment, cabin control and infotainment options. And there are even slots in the armrests for your smartphone, which then become an extension of the car’s software system using a Byton app. 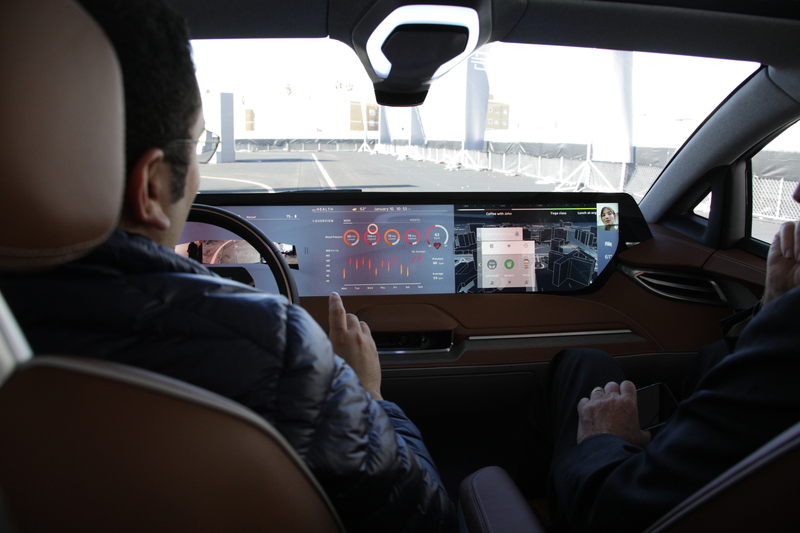 I got to ride along in the Byton Concept SUV and experience the innovative digital information system firsthand, and it’s unlike anything put forward by an automaker before. There are familiar elements, including maps and navigation, as well as streaming music services, but there also are a host of other, less expected apps and features — like health services, including fitness tracking for the car’s driver, a movie store, extensive office and calendar integration and much more. All of this is accessible through a central hub that takes the shape of an oddly angled geometric shape, which you can twist and turn using hand gestures thanks to the dash-mounted camera motion input system. You also can use gestures to dive deeper through menus, control playback and even arrange elements on the 49-inch screen, allowing you or a passenger to set up your driving desktop however you prefer. If it all sounds a little distracting, that’s because it is — there’s a lot going on across that display, and it definitely seems to have the potential to draw the driver’s attention away from what they’re supposed to be doing. But Byton says it’s all about offering up smart features that work as expected so as to keep focus on the road, and many of these infotainment offerings are meant for passenger use, not the driver’s — and for a future time in which autonomous driving features mean even when behind the wheel you could indulge in a bit of movie watching or catching up on your health and wellness stats. The Byton’s front seats also swivel toward the center of the car, giving you a better angle for chatting to passengers in the comfy, spacious rear cabin. Again, this is something intended to help future-proof the car’s design for when autonomy is available, rather than something Byton expects people to be able to take advantage of when they can first buy the car. The rear displays feature a simplified version of the front screen’s interface, and are plenty big enough to give passengers a great viewing experience for watching TV shows and movies. The integrated armrest smartphone docks are intelligently designed and a clever way to incorporate the powerful devices people have with them all the time with Byton’s built-in technology. As mentioned, there’s plenty of room in the back seat, and the luxurious seating really wraps you up. Everything from cabin lighting, to accents, to the massive overhead panoramic glass window feels top-notch and luxurious, even though this particular demo car was built from scratch in basically eight months. The drive experience itself is also impressive — the demo driver behind the wheel wasn’t afraid to push the accelerator even though there wasn’t much length to the track at its longest point. Instant acceleration made possible by the electric motor makes it feel terrific to take off from a full stop, and it’s got a lot of power throughout its speed range, with excellent handling based on the short course we were able to experience it on. This car still has a long way to go before it’s actually being sold — even though Byton is aiming to ship it by 2019, they currently only have $240 million in funding and it’ll take a lot more than that to produce an EV at scale, especially as Byton hopes to build 100,000 electric cars per year. Byton’s uniqueness as a new entrant isn’t limited to its ambitious rollout plan, or to its unique cockpit design. It’s also a blend of German executive leadership, Silicon Valley software design and engineering and Chinese manufacturing, which could be a very powerful combination — or an odd brew that makes things more challenging than they have to be. For now, based on my first impressions, this seems like a pretty strong start for Byton, and one that took a lot of people by surprise. Now, it’ll have to press that early strong showing and deliver on its big plans.